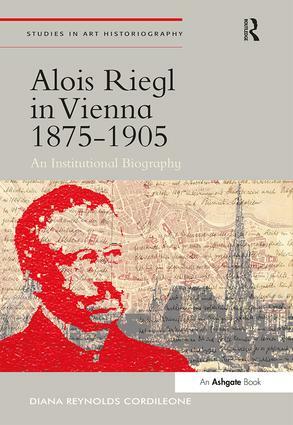 In Alois Riegl in Vienna 1875-1905: An Institutional Biography, Diana Cordileone applies standard methods of cultural and intellectual history for close readings of Riegl’s published texts, several of which are still unavailable in English. Further, the author compares Riegl’s work to several of the early works of Friedrich Nietzsche that Riegl is known to have read before 1878. Using archival and other primary sources this study also illuminates the institutional conflicts and imperatives that shaped Riegl’s oeuvre. The result is a multi-layered philosophical, cultural and institutional history of this art historian’s work of the fin-de-siècle that demonstrates his close relationship to several of the significant actors in Vienna at the end of the nineteenth century, an epoch of innovation, culture wars and political uncertainty. The book is particularly devoted to explaining how Riegl’s theories of art were shaped by debates outside the purview of the academic art historian. Its focal point is the Austrian Museum for Art and Industry, where he worked for 13 years, and it presents a new interpretation of Riegl based upon his early exposure to Nietzsche. Contents: Introduction; Part I Intellectual Foundations (1875-1885): Nietzsche as educator; Positivism as patriotism in Vienna; Manufacturing Austria. Part II Poetics and Politics of Art History (1885-1897): Stil-fragen, or, the multiple questions of style; Patriotism, piety and patrimony; The advantages and disadvantages of (art) history to life; Framing Austrian modernities. Part III Transformations (1897-1902): Riegl as educator; Affinity, attentiveness, and the historical Dionysian; A museum of his own; Dissolution as salvation; Conclusion: the Nietzschean palimpsest; Bibliography; Index. Diana Reynolds Cordileone studied art history at the University of Erlangen-Nuremberg and completed her education at the University of California, San Diego. She is Professor of History at Point Loma Nazarene University, USA. The aim of this series is to support and promote the study of the history and practice of art historical writing focussing on its institutional and conceptual foundations, from the past to the present day in all areas and all periods. Besides addressing the major innovators of the past it also encourages re-thinking ways in which the subject may be written in the future. It ignores the disciplinary boundaries imposed by the Anglophone expression 'art history' and allows and encourages the full range of enquiry that encompasses the visual arts in its broadest sense as well as topics falling within archaeology, anthropology, ethnography and other specialist disciplines and approaches. It welcomes contributions from young and established scholars and is aimed at building an expanded audience for what has hitherto been a much specialised topic of investigation. It complements the work of the Journal of Art Historiography.